What is the future of Iconic Ruins – buildings of cultural and social institutions in Central and Eastern Europe that were designed to be monuments of the communist era but are in a state of ruin today? In a unique exhibition, the Academy of Fine Arts and Design in Bratislava together with the Czech Centres present visions of transformation of these once prominent buildings into modern and viable urban spots. 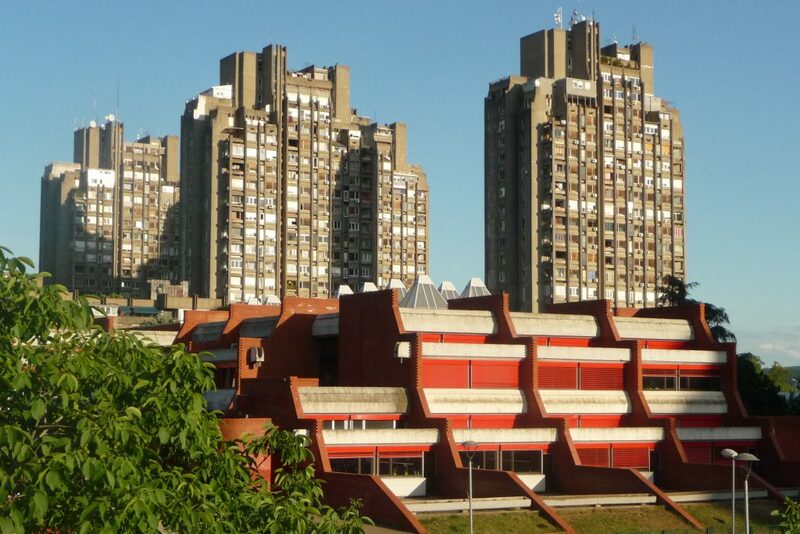 Only recently has post-war architecture of former socialist countries become a prominent topic. For a long time, the public had perceived it with reservations and against the backdrop of the often bleak personal memories and life stories impacted by the communist regime. Recent expert studies, however, reveal the surprising diversity of forms that architecture of this time assumed. Moreover, some parallel initiatives in the former Eastern bloc managed to anchor the region’s architecture into the wider frame of historically relevant world architecture. The ICONIC RUINS? exhibition focuses primarily on politically prominent public investment projects and looks at where ambitions of power and creative ideas of architects connected and where they clashed. Hosted by the gallery of the Czech Centre in Prague, the ICONIC RUINS? exhibition traces the evolution of socialist architecture in Visegrad countries – the Czech Republic, Hungary, Poland, and Slovakia. As photographs of socialist buildings are accompanied with details on the buildings’ current state and function, the exhibition presents a solid overview of post-war architecture up to 1989 in all four Visegrad countries. The vernissage will be followed by a discussion on the issue of society’s relationship with the exhibited buildings and how different Visegrad countries are coming to terms with their heritage. The exhibition also presents the work of students from the architecture studio of the Academy of Fine Arts in Bratislava (Vysoká škola výtvarných umení v Bratislave), in which they present their visions for the future of these iconic buildings. April 17, 2019 panel discussion took part of the accompanying program of the exhibition. The event is co-organized by the Goethe-Institut Prague, the Czech Centres and VSVU. The panel discussion took place as part of the Shared Cities Ideas Yards event series. We invite inspirational experts to present new approaches in sharing of knowledge, experience and data, in community engagement and the use of cutting-edge technology to improve the quality of urban life.